sending to share@realtimefarms.com: now with autotagging! Sending in a photo to share@realtimefarms.com is the easiest way to capture the action while at a farmers market, even automatically posting to the correct market if your phone has gps. Starting this morning, you can now include the names of vegetables and other items in your email in a special format (e.g “.kale.mustard greens. horseradish”) that will automatically get parsed and added to your post. This worked pretty well. Since my phone has gps, the photos included gps information in their exif tags. 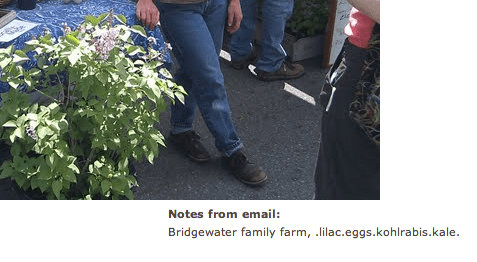 Using this information, Real Time Farms automatically tags the post sent in by email with the closest farmers market. This means users of the site could see my photos as soon as I sent them in. I would also include some notes in the subject and body of the email to remind myself and others what the photo was of. These show up as ‘notes from email’ in the tagging page. These notes help myself and others choose the right farm and vegetables for the post. This proved so useful that I started sending in almost all of my photos this way; the extra note made it much easier to remember. In the future we would also like to support a format for tagging the farmers market and farm, but thought we’d get this out as soon as possible. Also note that even if the tags are automatically parsed, the full subject and body will still be displayed as ‘notes from email’ when tagging a photo. This entry was posted in Messages From the Founders and tagged autotagging, email, karl rosaen, Real Time Farms, smartphone. Bookmark the permalink.